After cattle had been put ashore there in the first half of the 15th century, the settlement of the island started in about 1460 when natives of northern Portugal arrived after calling at Terceira and Graciosa. 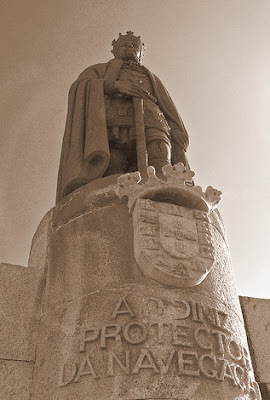 its first Captain or Donee was Alvaro de Ornelas, who never took effective possession of the island, so that it was incorporated in the captaincy of Faial. It soon had its first town in the form of Lajes, followed by São Roque in 1542. The population initially concentrated on the growing of wheat and, to a limited extent, of woad, a dye-yielding plant exported to Flanders, the latter through the influence of the neighbouring island of Faial, but these activities were soon joined by wine-growing and fishing. This was followed by centuries in which the island lived practically at the margin of history, a situation which was interrupted by important volcanic eruptions in the 18th century. In 1723 Madalena was raised to the status of a town, confirming its economic importance as the port ensuring connections with Faial and as the place of residence of the owners of the large vineyards in the area, which by then was already producing wine. By dint of hard work the lava beds were turned into orchards and vineyards. The verdelho wine of Pico enjoyed international fame for over two hundred years. It was highly appreciated in a number of countries, namely, England, America and Russia, where it reached the table of the Czars. The oidium attack, in the middle of the l9th century, destroyed the vines. Recovery has been slow and based on the use of new shoots. The presence of American whalers in the waters of the Azores as from the end of the 18th century introduced a new activity in Pico - cachalot hunting which for years represented an important source of wealth for the island. Nowadays Pico is an island that is experiencing economic development, made possible by the building of new ports and the airport, which was recently opened.